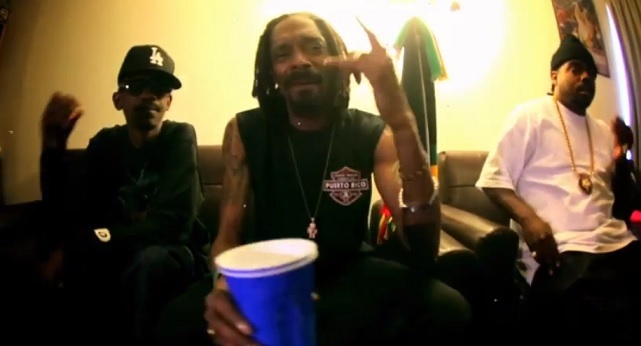 Snoop Dogg is back with a new music video for the super fresh and hypnotizing banger, “Bad 4 Me,” featuring Kurupt and Daz Dillinger. The Dae One produced track finds Snoop and Tha Dogg Pound chillin’ out and puffin’ on some fine smoke while clips from the film Menace II Society transition in and out. Hosted by DJ Drama, “Bad 4 Me” shows up on Snoop’s latest collaborative mixtape entitled That’s My Work Vol. 2. This entry was posted in Music, Video and tagged bad 4 me, daz dilliner, dj drama, hip hop, Kurupt, Music Video, rap, Snoop Dogg, that's my work 2. Bookmark the permalink.